Chicken Rice Casserole makes for a crowd-pleasing dinner that comes together in under 5 minutes of prep time. for dinner. This dish is deliciously easy, creamy and totally satisfying and you’ll never believe it needs just 4 ingredients! This is a special dish because the recipe comes from my BFF, Penny and she’s been making this for years. It’s her go-to, must have, favorite easy weeknight meal that I just had to try. I have to admit, when I first made it I knew it would be tasty but… I had NO idea what I was in for and it’d definitely become a regular in our rotation! This easy dish comes together in under 5 minutes, it’s one of the quickest dinner preps on my whole site (along with One Pot Pizza Tortellini Bake). This dish is belly warming and comforting while being simple and easy to make, it’s like serving a nice warm hug from your Mom! 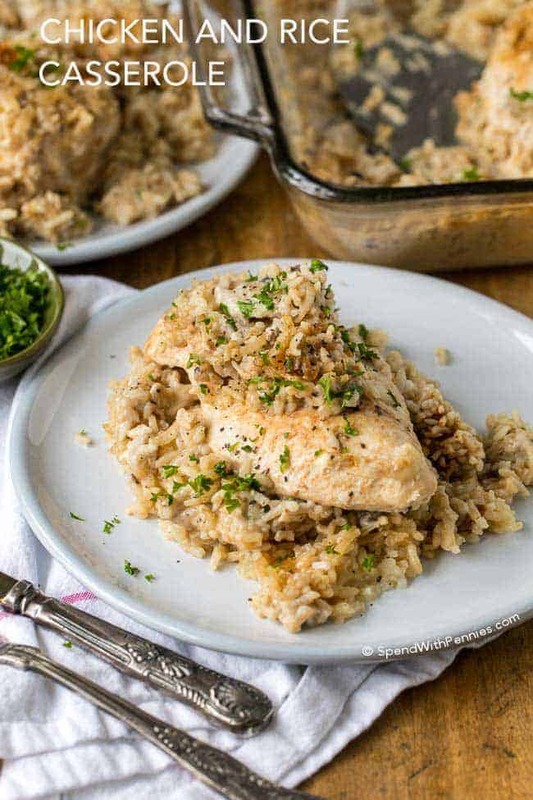 The chicken comes out incredibly tender and juicy, the rice is perfectly cooked in a rich and creamy sauce and the whole thing is loaded with flavor! 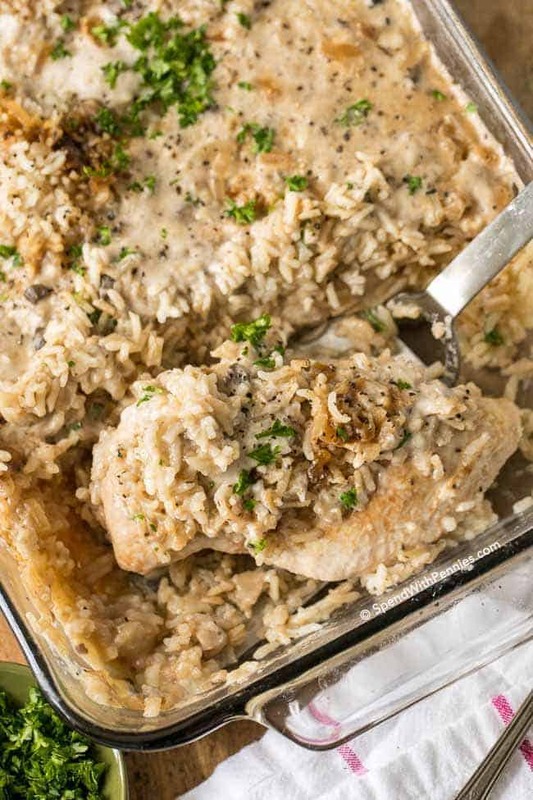 This easy Chicken Rice Casserole takes about an hour to bake (depending on your oven, you may need a few extra minutes but for me it’s about an hour), but that is one of the things that make it kind of the perfect dish. We’ve made this just as written over and over but I’ve also added a little bit of onion to the bottom of the pan or a couple of handfuls of fresh mushrooms. With very little minimal prep time, you can slide this casserole into the oven and relax, or maybe help with homework without feeling the usual dinner time rush! 5 minutes of work, and then perhaps a glass of wine or read your book for an hour? I feel like that’s a good idea for ALL weeknights! I use homemade onion soup mix in this recipe, but you can use the kind in the envelope if you haven’t had a chance to mix up a batch yet. The flavor will be amazing either way! My friend Penny also said she sometimes replaces the onion soup mix with a packet of gravy mix depending on what she has on hand! If you are lucky enough to have leftovers, this makes for a delicious lunch the following day. I am so glad that this recipe was well received with your friends Elina! Sorry you didn’t enjoy it as much as we do Lizze! I have only made this recipe as written. I think if you dice the chicken, you will want to keep an eye on the cooking time so that the chicken doesn’t overcook. Do you use regular or thin cut chicken breasts? This looks so super yummy. Thanks for posting this. I use regular chicken breasts (boneless) as they do cook quite a while. Do you use thick or thin chicken breasts? Sounds delicious! Thanks! Hi Tammy, I used a thicker chicken breast. for 5 people how many tweaks should I make in this recipe? I would suggest adding an extra chicken breast so there are 5. I love the idea of adding mushrooms and pimentos to this dish Angelina! That sounds so yummy! I wonder what this would be like with brown rice. I guess that I would have to cook it a little bit longer. I’ll have to give it a try. While I have only made this as written Mabel, other commenters have had success with brown rice. I hope you love it! I am so glad you enjoyed this casserole Criatina! I use Cream of Celery soup in place of the cream of mushroom and it is fantastic. Creamy of Celery would be great, glad you loved it Susan! Thank you so much for your kind words Lisa! this looks good and easy…however i help cook for a friday night recovery meeting and foods need to be in crockpots bc there is no kitchen….could this be adapted to cooking in a crockpot somehow? I have never tried this recipe in the slow cooker. Some readers have tried it in the slow cooker with success. I’d think 8 hours should work. Let us know if you try it Debra! So excited to try this! Do you think I could prep ahead of time and leave it in the fridge to cook for dinner? Or will it mess up the rice? Thanks! I haven’t tried making it ahead. Let us know how it works for you if you do make it ahead, Kaitlyn. Can you use minute rice not cooked also? I’ve only tried this as written Joanne. If you do try it with Minute Rice, you may need to reduce the cooking time. Let us know how it goes! I love this dish! However I make it even easier by seasoning chicken placing in pan, then mixing remaining ingredients in a bowl. Pour over chicken and bake! So happy to hear that you love this chicken casserole! Great tip Di! Your recipe doesn’t say if the chicken breasts are boneless/skinless, or whole bone-in breasts. The photo’s appear to show the boneless kind. My preference is for whole bone-in breasts because I think the flavor is better. If using these should I bake the casserole a little longer or at a higher temperature? Thanks! I use boneless skinless breasts although I do agree that bone in adds great flavor! I would suggest about 90 minutes total (but I haven’t tried, so you may need to adjust). You’ll want to ensure your chicken reaches 165°F. If you leave the skin on maybe broiling a minute or two at the end would help crisp it up. Enjoy and please let us know how it works out for you! Could I make chicken and rice in slow cooker instead of the oven. If so how long would it need to cook please? I have never tried this recipe in the slow cooker. Some readers have tried it in the slow cooker with success. I’d think 8 hours should work. Let us know if you try it! Next time, I will mix the onion mix into the water and cream of mushroom, and then mix with the rice. And lay the seasoned chicken on top. Delicious! I am glad you enjoyed the recipe Kristel! Paired with the Italian Salad. Which was also delicious! That sounds like a perfect dinner to me Laura! So happy you enjoyed it! I would suggest using just half of the can (there will be a little bit extra but it will work just fine) and saving the rest for another recipe or freezing it for next time. Can you use jasmine rice with this recipe? I haven’t tried this recipe with Jasmine rice, let us know how it goes if you try it! It was delicious! I used chicken broth instead of water, it made the casserole too salty for my taste. Maybe I put too much salt on the chicken? Next time I wont season the chicken and use chicken broth or use water and season the chicken. Overall I still give this recipe 5 stars. I added French onions to it and sprinkled on top toward the end of cook time. Delicious! Thank you! Those sound like great additions, so glad you loved it Tisha! forgot to mention I used cream of CHICKEN soup. I just don’t like cream of mushroom and thought the chicken flavor would go better with the…chicken. Delicious. made this for supper last night. everyone loved it! even my 8 y.o. granddaughter who is a very picky eater. I cut the chicken into bite sized chunks and added frozen peas. YUMMY! So glad your family loved it Dolly! Did you cook the peas separately & then add them at the end? Can you make this with brown rice instead? would you adjust the liquid?? I have not tried this recipe with brown rice. The cooking time will likely be longer. Other readers have mentioned that they needed to add some liquid to the rice as well. Please let us know how it turns out if you try it. I am so glad you loved it Julie! Peas sound like a great addition. Enjoy! How much extra did you add ? Holly, do you rinse your rice before you pour it over the chicken? No I don’t rinse the rice. Enjoy Jann! I have made this recipe for years. It came from an old church cookbook and it is called “Forgotten Chicken”. I’ve used different cream of soups. The recipe I have is for a double batch do I mix different soups together. My favorite is broccoli. Works in a slow cooker, too. It called for a whole cut up chicken but I love it with thighs and drumsticks. Can’t go wrong with this recipe. I love it. An oldie but goodie for sure Kristi! 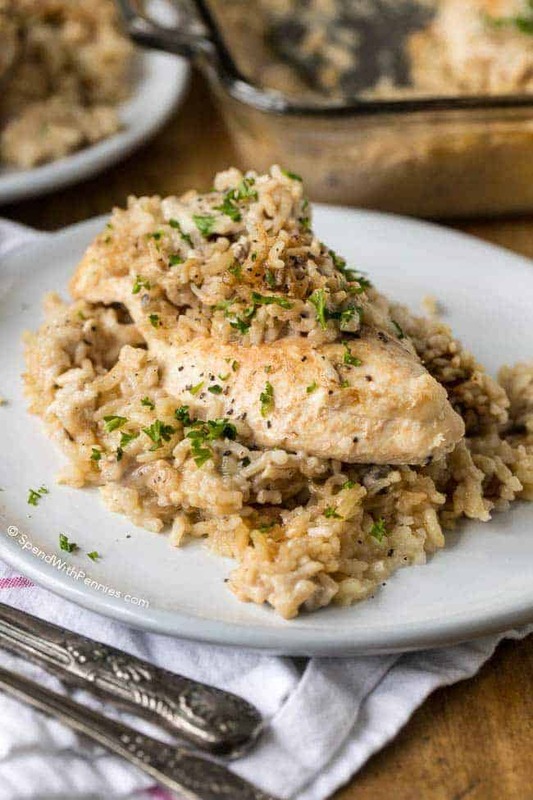 It sure can, here is the Instant Pot Chicken and Rice recipe! 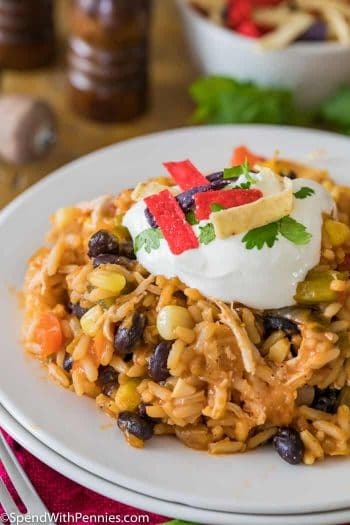 Here is the Instant Pot Chicken and Rice recipe! Can this be made with medium grain white rice? What would be the cook time? Thanks. I look forward to making this. I have not tried this recipe with medium grain rice, so can’t say for sure. Please let us know how it turns out if you try it. I tried it with medium grain rice and of course, the rice is a bit more sticky as i would have expected. It’s what i had on hand and i wasn’t disappointed. What could you use in place of the onion soup mix? Please send me a copy of the reply to my email. Thank you. I use homemade onion soup mix in this recipe. My friend Penny also said she sometimes replaces the onion soup mix with a packet of gravy mix depending on what she has on hand! Super easy, fast meal! I used 2 lbs boneless chicken thighs because that’s what we prefer. I also doubled the amounts of water, cream of mushroom, onion soup mix, and rice, so that each of us could have a full side of rice. It didn’t require longer cooking time. Will definitely make this again!!! YUM! So glad it worked out well for you Sandi! Chicken thighs would be great in this recipe! Thanks for the recipe, turned out great. I’m always looking for easy recipes this was perfect and is a keeper. Darn! You could try to thicken it with a cornstarch slurry. I’m sure it’ll still taste delicious! 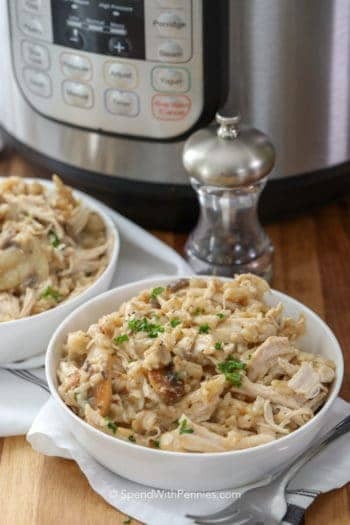 How can I convert the chicken and rice recipe for an instant pot? So I didn’t read the cover part and it’s cooked for a hour. How long do you think it’ll take for the rice to get tender if I covered it now? I can’t say for sure as I don’t know how long it’s been in the oven. Hope it worked out for you. Hi there! Looking forward to making this tonight. Can you assemble ahead and refrigerate until time to bake? Hi Jana, I don’t see why not. Just make sure you cover it in the fridge! I loved this recipe! My toddler and husband both liked it as well. Definitely will make this again. Happy to hear your family enjoyed the easy casserole CC! Can you make this with wild rice? If so, leave uncooked as you do the white rice? I have never made this with wild rice. You may need to adjust the cooking time to make sure that the wild rice is cooked through in this recipe, or cook the wild rice separately. Enjoy Lisa! I make this with bone in, skin on chicken leg quarters. They’re always very cheap so I buy the bulk bag. Takes about 15-20 min longer but it’s delicious. Thanks for the recipe! Thanks for sharing Nik, bone in chicken adds so much flavor too! I bought brown basmati rice from Trader Joe’s. Has anyone tried this as a substitute? People often cook rice separately from other dishes and this chicken rice casserole, in my opinion, is a huge advance combining these ingredients! Yummy!! Thank you Natalie! I agree, it’s convenient to be able to make them all at once. I made this for dinner tonight. I followed the recipe, except I used cream of celery soup. My husband does not eat mushrooms. This is my new Chicken & Rice recipe from now on. So glad you loved this casserole as much as we do Linda! Hello I’m wondering if anyone added any cheese into this? Also I see a few people used minute rice. It still came out ok? I’ve only tried this as written. If you do try it with Minute Rice, you may need to reduce the cooking time. Let us know how it goes! I love the simplicity of this dish. It was not as rich as the way I normally prepare chicken and rice. It was less calories, less fat and less dairy. At my house we have recently been a little under the weather, and this was just what the doctor ordered. So glad your family loved it Penny! I don’t have rice on hand and am housebound. Think I can use Pasta? I have only made this recipe as written, but I think pasta would work. Let us know if you try it Nancy! You may also enjoy this Chicken Noodle Casserole, One Pot Chicken Pasta, Ranch Buffalo Pasta Bake or Cajun Chicken Pasta! Had anyone ever had success using frozen chicken breasts? If yes, how did you change cooking time/temp..if at all. I haven’t made this with Minute Rice so I can’t say for sure. Please let us know how it goes if you try it. I was VERY disappointed when I found this 4 ingredient recipe had FIVE ingredients. Change the name please so you dont mislead. If you consider water to be an ingredient then yes there would be 5. I did not feel misled! Thank you for your awesome recipe! I definitely appreciate any recipe with this few ingredients that helps cut down on my dinner prep. Thank you for your kind words Tiffany! I’m glad you love this recipe as much as we do! Im pretty sure you should have some water in your house somewhere? SMH! Rie – Are you actually being serious? If so, we can do without your pettiness. Hopefully it was a failed attempt at humor. REALLY???? How old are you and should you even be on the internet by yourself. This is a tried and true recipe whether it has 4, 5, 10, 20….please!!! What a petty thing to pick about. Why would you consider water an ingredient? Your fault for being disappointed in that. The heading is correct. It has only 4 ingredients. No need to change it. Ohhhh❤️, I grew up on this stuff! !., Haven’t had it in years.., Thanx for posting!!! You’re welcome. Enjoy Lori! It’s a favorite around here for sure! I made this tonight but I had to cook it a lot longer. We had seven chicken breasts and I cook for a very large family. Which means I had to add more rice. It’s not done yet but I can’t wait to try it. Thanks Holly! I tried this recipe just tonight. I used a 9×13 glass baking dish, sprayed with Pam and sealed with foil. Instead of breasts, I used 6 boneless, skinless, chicken thighs. I also used Brown Minute rice as I was out if white rice. I cooked it for the time specified and checked it but it wasn’t quite done. I resealed it and cooked it for an additional 25 minutes and voila! My son loved it!! I think I’ll stir the cream of mushroom soup, water, and the onion mix together at once the next time I make it-reserving some to pour over the chicken before cooking. Thanks again! So glad you enjoyed it Barbara! 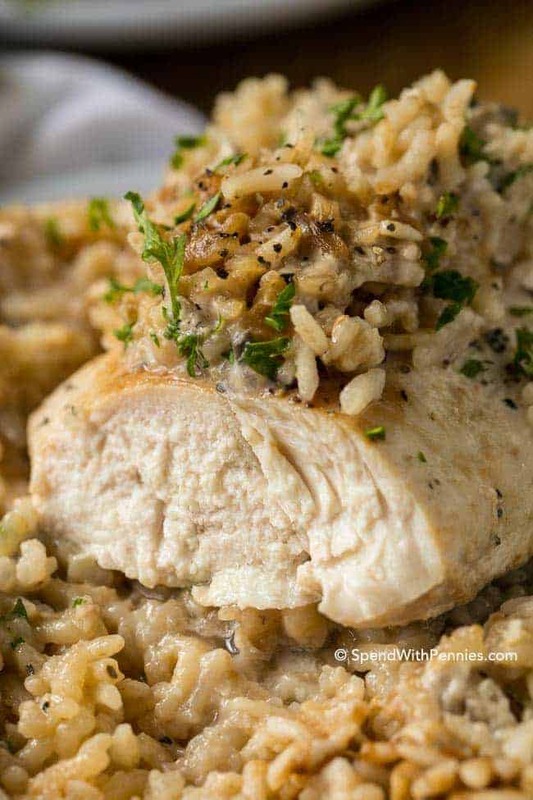 Brown minute rice would be great in this recipe! Thank you for the recipe! Has anyone tried this in the slow cooker? Would you cook on low for 8 hours? I want to try this with wild rice, for a change for the fam! Have you ever cooked this in a slow cooker? I have one of the casserole sized ones. Any idea how long to cook it? This will definitely be a staple meal in our home! A couple of questions. My rice was crunchy. Did I not cook it long enough? If I double the recipe how long would I leave it in the oven? If your rice was crunchy you may have needed to cook it longer. Was it completely sealed while cooking? I haven’t tried doubling this recipe so I can’t say for sure how long. Melissa, I made this tonight and doubled, actually cooked 11 chicken breast, the recipe and it did take longer. I cooked it at 325 degrees for 2 hrs & 15 minutes. I used white rice because my grandchildren were here and each one ate at least three helpings or more. It was definitely a huge hit. After dinner my grandson came and asked if it would be too much trouble for me to get him some more. That is the biggest compliment a child can give a grandma! Tasty! I also added garlic powder to the chicken. Mixed the onion soup with the cream of mushroom and water (I actually used milk as someone else suggested). Cooked for 1hr, 35min. Easy to prepare. I can definitely see myself making this once a month. Thank you for sharing your tips Shauna! In our house growing up we had “souper rice”. We cooked the rice in one can of cream of mushroom or celery.or chicken soup with 1 can water. Delicious side for any meal! Hi Holly! I am new to this blog today and was looking for an easy casserole. Not only is this was but it is absolutely delicious. Thank you. So glad you loved this casserole! Curious….my household is not chicken fans. Do you think I could substitute pork chops for the chicken? I have only tried the recipe as written. I think that would work though! Let us know if you try it Renna! It sounds delicious! Making this tonight. I doubled the rice bc that’s what my boys like the most. I mixed the rice and soup and water and onion mix together and put them in the bottom of my stone baker (I use this thing for everything). I seasoned the chicken with something else besides salt and pepper. Waiting on it to come out now. What did you use for the garnish at the end of the video? Hi Joanna, parsley was used as garnish at the end of the video. Sorry if this was asked already but do you think I could use brown rice instead? Thanks! I tried with brown rice second time I made. Didn’t care for it as much. I had cream of chicken in my cabinet, so I tried it with that. Sooooo, my husband, who HATES rice…said…He Could Eat This Meal At Least 3x Per Week! It was amazing! Thank you for the recipe! Thank you Lisa, I’m so glad that your husband (and you!) loved this casserole! We love it too. I used a can of coconut milk instead of cream of mushroom and my daughters thought I had added cheese. They also didn’t notice it was brown rice. So yummy! Tried this tonight! Rice was amazing but the chicken was a bit dry. Any suggestions? Thank you! Sorry to hear it was dry. I have made this many times and it worked for me. Other readers suggested using larger chicken breasts. Hope it works for you! HOWEVER, I found that using Instant rice instead of long-grain regular ensures that the rice is completely done. AND, I also cover it with aluminum foil while it’s baking. I am going to try this recipe over the weekend. You said that you used milk instead of water. How much milk did you use? Hi Penny I have made this receipe before its fabulous one question. How can I double the rice? How much extra soup and water can be added to make 2 cups of rice instead of 1? I have only made the recipe as written. To double the rice, you may want to do a separate dish with a second recipe of the rice. Thank you for sharing Erika. So glad your family loves this recipe as much as mine does! Great and simple casserole. Thanks for sharing this. I was wondering if anyone has tried this using cauliflower instead of rice? I can’t have the rice but this looks delicious. I haven’t tried it but if you do, I’d suggest eliminating most or all of the water. The rice soaks up the water and cauliflower may produce a little bit of liquid as well. I would think you may want to use approximately 3 cups of cauliflower rice. 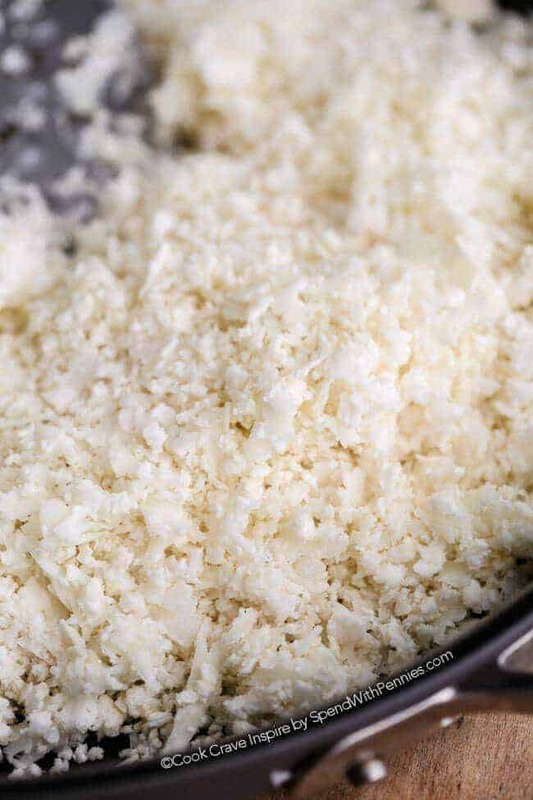 If you use cauliflower rice, please let us know how it works out for you! Loved it. Made it by the recipe the first time. With broccoli and mushrooms. The second time, I had all of the ingredients except the condensed soup so I improvised with 2c. chicken broth+ 1c. Greek yogurt+ Italian seasoning (no extra water) and I loved it even more. Thanks for sharing! Great changes Kirsten! Thank you for sharing and so glad to know you loved the casserole. It MUST be great if it’s better than Mom’s! So glad you both loved it! Oh no, how disappointing, I can’t say for sure why this didn’t work out for you. :( Did you add the full amount of water? Was your pan sealed very well? What type of rice did you use? when i made this my family raved so much about the rice they wanted me to make more of it next time. 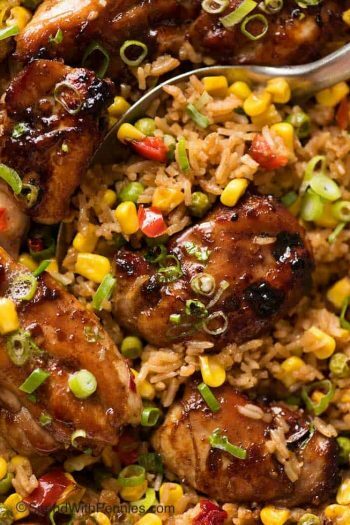 if i made another pan and used all the ingredients, amounts,cooking time etc from the recipe without the chicken breasts would that work to give me a seperate pan of the same rice as it comes out in the original recipe? I haven’t tried it, but think that would work Jonny. Let us know if you try it! I have not made this yet – I am making it tonight. I would think it might not be as flavorful without the juices from the chicken. 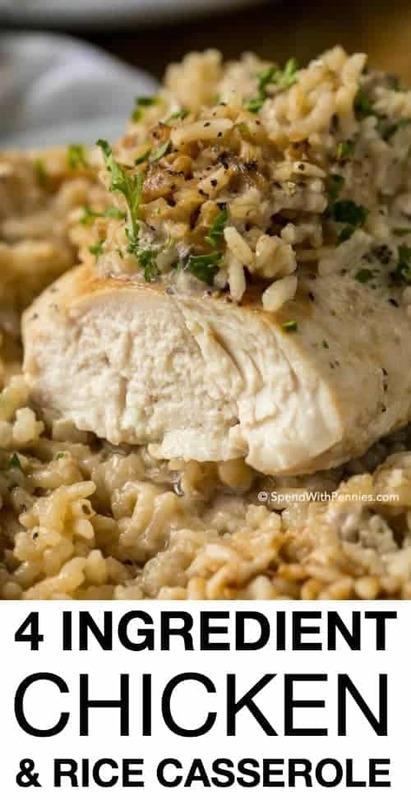 I would do it as you stated – 2 separate pans and all the same ingredients but I would put 2 of the chicken breasts in each pan so the juices from the chicken can flavor the rice also. I made this for my beef-loving family and am relieved to have a new chicken dish to add to our recipe repertoire. You use only the 1 1/2 cups water listed in the recipe. Glad you enjoyed it! I am trying this recipe for the first time tonight. But I was not sure whether the recipe called for an ordinary can of cream of mushroom soup or the condensed variety. Based on these comments here, it seems that the original author does intend for condensed soup to be used. Can you please make that clear in the list of ingredients above? Thanks so much! I do use condensed soup for this recipe. I have updated the recipe. What is the green it isn’t garnished with? Do you think using 1 1/2 cups of chicken broth instead of water is a good idea? I’ll be making it for the first time tomorrow. Thanks! I have only tried the recipe as written, but I am sure it would add some flavor! Let me know how it turns out! Renee, I was thinking of using chicken broth too. How did it turn out? I am making this now and I used chicken broth and onion and garlic powder and Italian seasoning because I didn’t have the onion soup like I thought I did. I made this completely as is and it came out amazing! the whole family raved it was so delicious and so easy! I also made the blueberry cobbler for dessert and it also was to die for thanks so much! these are both in my regular rotation now and im sure more from this site will be, love it!! I am so glad everyone loved it! If I want to just make 2 chicken breasts, should I use half the ingredients and a smaller dish? Or still 9×13 and same cooking time? I haven’t tried it but think it would work. I would suggest a smaller pan and no adjustment to the cooking time. Let us know how it works out for you! Hi there! Love this recipe, have made it many times! If I were to try this with brown rice instead, do I up the cooking time or temp? I’m sure it would work however I’ve only tried this with white rice. Please let us know how it works out for you if you tried it! Is frozen chicken breast ok? Or should it be thawed?? I’ve only tried this with thawed. OMG this was so good, oh so tender breasts of chicken. This was the first meal I have cooked in so long, my brother was here and he loved it. Thanks so much, I must sign off as I am so full I should feel ashamed. I’m so happy to hear that you and your brother loved this casserole! Hi Holly! We tried this tonight, and it was awesome! The only change I made was that I used 4 bone-in thighs instead of 4 breasts. You were right about the timing; I did 1 hour and 15 minutes and the rice was still a little bit chewy, so I put it back in for another 10 minutes and then the rice was perfect and the thighs were almost falling apart and they were really tender and full of flavor. Everyone loved it, so I’ll be making this again for sure! I’m so glad your family loved this as much as mine does! Sounds yummy, bone-in or boneless chicken? I use boneless chicken breasts. So i already started the recipe and realized i have no aluminum foil. And cant go get any. What should i do? Fast and easy! My whole family loved it ! I made this! Wow so easy! Every one ate this! I made it to the recipe with Lipton onion mix. I put it in with the oven timer set for one hour & 10 minutes. Then, I left to run errands. I came home 11/2 hours later. Served a steamer bag of broccoli & served dinner. I looked like a champion. I do suggest that you use 2lbs of chicken or slightly less. If you have giant chicken breasts, cut them in half the long way & lay them in the dish. 5 stars! Easy flavorful! So glad you loved it Christine. Could you half this recipe? There are only three people in my house and one of them is a 10month old, she and I will eat this but husband is super picky and works late so he probably won’t. Also have you ever added broccoli to this and if so what was the turnout and do you need to adjust the liquids for the broccoli? I haven’t tried it but think both would work. I wouldn’t think you’d need to adjust liquid for the broccoli. Let us know how it works out for you! Hi can this be made with chicken mince? If so would you mix it all together before putting it in bake tray to bake? I haven’t tried it that way so I can’t say for sure. I would likely cook the chicken first and the combine it all to bake. Let us know how it works out. I just made this for the first time and it came out delicious. So easy to make! I made it with Cream of Chicken soup because I was out of Cream of Mushroom and served it witb steamed broccoli. It is versatile Loreen! Glad you enjoyed it! Will not make again. Tossed most of it. Sorry to hear that you didn’t enjoy it Katie. My family loves this casserole. I added frozen broccoli and cauliflower, baked about 1.5 hours. It turned out great! This is one of my most favorite meals ever!!! I just love it! Easy and absolutely delicious. The first time I made it my chicken was a little dry, so I used larger breasts this time and it was perfect. Thank you! PS. It is 5 points on the freestyle WW plan for anyone interested in that info. I used a rotisserie chicken that I shredded – way easier. Love the sound of that Joni!! I haven’t tried freezing it, please let me know how it goes if you do! I followed instructions to a tee The only thing was my rice was still not cooked all the way. I have made this several times and it always works out, so I cannot say for sure why. Did you cover it tightly? Excellent recipe…no problem with Rice or Chicken..both cooked fabulous..tasty and tender. I added some Broccoli and it was perfect. Cooked it for 1 hr and 20 min. Thank you Michelle! Glad you loved it! A very easy recipe to prepare, but the temperature of 325° was not hot enough to bake the casserole in 1 hour and 15 minutes. I had it in the oven at that temperature for an hour and a half and the rice wasn’t even cooked. I turned the temperature up to 380° for 45 mire minutes to finish it. I used chicken tenders and cooked at 350 for an hr. Came out perfectly. Soo good. sound great…I am making this today.. Was wondering, is this freezable? I haven’t tried it but I do think this would freeze perfectly once cooked. My whole family loves this recipe, me especially because it’s so simple to make! I love love this but I use cream of chicken instead of the mushroom one. I also use brown rice and add an extra 1/2 cup. This has been added to our monthly favorites now. Thanks so much for it, we love it. Sounds yummy! Happy to hear that you love it Candace! I use this same recipe with long grain wild rice and cream of chicken and a small can of sliced mushrooms yum! If I mix it all in the morning before going to to and leave it in ththe fridge during the day do you think it will still cook fine that evening? I don’t thjnnthr rice will absorb too much before cooking while sitting in th fridge. I like to assemble early that way the first one home can just pop it in the oven. I haven’t tried making it ahead. Let us know how it works for you if you do make it ahead, Jess. My rice was super mushy. Looks more like mashed potatoes! Great flavor but it doesn’t look very appealing. What type of rice did you use? Made a double batch, but the he rice didn’t cook all the way. Maybe I should have done 1 and a 1/2 Times the rice for a double batch? The chicken was awesome and tender! Once I microwaved is the rice mixture a little more, it was a hit! This casserole turned out great! I didn’t have bunless chicken breasts on hand so I used boneless skinless chicken thighs. Hubby has asked me to make it again and the kids devoured it! What’s your water to rice ratio? My rice came out very mushy. Yes. The only thing I suggest, is cooking the rice first. Otherwise it was very tasty. Do you know how to convert this for the instant pot? I’ve haven’t tried this in the Instant Pot. Let us know how it works out if you try it. Changing the ratios of a recipe will certainly affect the results. Sorry this didn’t work out for you. Have not made this recipe yet but wanted to know if long grain INSTANT white rice can be used? I’ve have only made this as written. Let us know how it works out if you try it. How did your instant rice turn out? That’s the only thing I have on hand right now. I found this recipe after already starting to cook my long grain brown rice but decided to try jacking it up some lol. So I used my precooked frozen chicken breast in a 9X13, put a few frozen bell peppers then put my cooked rice on top then added a envelope of onion soup mix on top of that then added 1/2 cup of water to the can of mushroom soup and poured on top. Baked 25 minutes and turned out and tasted Da’Bomb !! Peppers would be a great addition, thanks for sharing! White wine sounds like a great addition to this recipe! I am so glad you enjoyed this recipe Theresa! Fabulous no brainer dinner! Since I hate dishes I took it out 20 min before it was ready and added fresh broccoli and green beans. Then popped it back in. I also made it in my corning ware roaster. Hi! This sounds yummy! Can I do this without chicken, same cooking time? I haven’t tried it but I don’t see why not! Any idea how to convert this recipe to for an Instant Pot? Hi! I’m going to try this tonight , but I’m trying it without meat added . Just the rice and everything else. Do you think it will work? For sure it will work! Enjoy! Couldn’t be easier. I wanted to make my own soup mix but didn’t have dried onions, so I used onions I cooked and added the other ingredients. Such a small amount of effort for big flavor. I will make this again. I will be adding to this recipe as it is very versatile. I served with fresh asparagus and had a complete delicious meal. BRAVO Holly. I’m so glad you loved it Peggy! This is soooooo easy. It’s also so delicious, my 2 year old is eating it and saying “yummy” after every bite! Can you cook and then freeze and then reheat? If yes…how long and what temp do you suggest for reheating (once it has thawed)? Thinking of bringing this to a family in need of easy to prep meals. I haven’t tried freezing this recipe however rice casseroles generally tend to take about an additional 40-50 minutes. I usually cook them covered to keep them from drying out. Can I suggest putting the 1 1/2 cup water in the list of ingredients? We made this recipe without adding the water. Ummmm, didn’t turn out. It’s our fault that we didn’t read the directions clearly, but might help if it was added to the ingredients. Great suggestion, thank you Dawn. I’ve updated the recipe. This was amazing. I used long grain brown rice and cream of chicken instead of mushroom. I will definitely make this again, but I think I’ll add 1/4 cup more of water and cook a tad longer to make sure the rice is completely cooked. Otherwise…Great recipe! Thanks! I wanted to make something tonight that was quick and I that I already had all the ingredients at home. So, I stumble across your recipe. My family loves chicken and rice. I noticed people asking about the type of rice to use; however, I guess I am the only one that has tried it with minute rice. So, just fyi, Minute Rice comes out perfectly! I also used chicken thighs. It was juicy and delicious! I served this with a side of sauteed zucchini. I am so glad you enjoyed this easy recipe! Chicken thighs have worked well for other readers. Sounds like there is no need to change anything. Enjoy, Vanessa! Wow….this was DELICIOUS. I did everything except I used cream of chicken soup as we don’t like mushrooms at all. I used white rice (it was the long grain white Premium that cooks in 5 minutes) and I checked it at one hour. It was perfect. I will definitely be making this again. Thank you!!!! Thank you so much for this perfect recipe! I searched many and decided on this one and I am so happy I did!! I am now a follower and am excited to try your other recipes. I followed the recipe exactly as submitted! Delicious! It would not allow me to mark the 5th star for this 5 star recipe. Was really good but next time I won’t pour the rice over the chicken because some did not cook. I used dark meat and was delicious! I am not sure what I did or didn’t do. I made this for dinner and it turned out awful. I had to throw it away. It was like it didn’t have enough liquid. The rice was crunchy and had dry spots in the casserole. I love easy casseroles, just wanted to see if this happened to anyone else or suggestions to make it work. How disappointing! I’ve made this so many times and it always turns out great. Did you add the 1 1/2 cups of water? What type of rice did you use? When I saw this recipe I thought way to easy! But made it and oh such a great tasting meal!!! I dusted the chicken liberally with a low salt Cajun seasoning, too, it was yummy…….. If you use cauliflower rice how much should you use. Would the seasonings be the same? Could you give options for the cauliflower version in your other recipes please? This is so so good. I used cream of chicken soup the first time I made this and it was great. Even picky son like it. Have also made it using cream of mushroom soup and the beefy onion soup mix and it was also good. I do use only brown rice though and it was done to perfection with the amount of water and time recommended to bake it. Thanks for this recipe, it will be a staple for us now. This recipe is for 4 servings. You’d need 6 recipes plus one extra chicken breast. Enjoy Lisa! I’m so glad you loved it Lori! So simple, so very good! Thank you for sharing! Made this today because my mushrooms went bad for another recipe Took seriously 5 minutes and was done in an hour! I used minute rice and thin slices chicken breast and everything was perfectly done!!! Love this recipe and will make again and again when need something fast and kinda healthy! These are all ingredients most have in their pantries at all times! This was an awesome meal. My family and I loved it. It will definitely be made again in the near future. I’ve looked at all the comments but I didn’t see the answer so I’ll ask the question again…. If you use brown rice how much water should I use & how about cooking time? Great recipe. Easy and only 4 ingredients. Will make again. Horrible recipe. Followed it exactly, checked the chicken and it’s still completely raw! Whoever wrote this recipe shouldn’t quit their day job. This is my day job. :) Chicken breast should definitely not be raw after cooking it for 1 hour and 15 minutes, have you checked your oven temperature runs at the right temperature? I made this tonight and it was absolutely AMAZING!! I used 1 1/2 cups of rice and since I was cooking 2 cans of cut green beans, I used 1 1/2 cup of the juice from the beans and 1/2 cup water and mixed it with the cream of mushroom soup. The only thing I changed was a little more rice and enough liquid to compensate. The ones of you that said the rice was still hard….. The list of ingredients doesn’t have the water listed but if you read on, it says to sprinkle onion soup mix on top of rice then it says to mix the can of mushroom soup with 1 1/2 cup of water then pour over the top of everything. Mine turned out very creamy and seasoned perfectly. I paired it with the green beans seasoned with butter and mesquite seasoning and cooked til most of liquid is gone (taste like fresh beans like that) and toasted some garlic bread. I will start using this as my go to recipe. It made a lot! LOVE LOVE LOVE!!! My mother in law made this dish and it was always yummy. But I make it and not so. The rice cooks up mushy. I am hoping to try again using your method. It must be a mother in law thing. A little different. We used one can of cream of mushroom soup or chicken soup and one can of golden mushroom soup and 2 cups of water or chicken stock. A teacher gave us this recipe about 50 years ago and we have been using it frequently ever since. There times we substitute a cup of wine instude of one of the cups of water, that gives us a different flavor since we serve it a lot. Our 3 boys loved it and have taught their wives how to make it. I guess our version would not be classified a penny recipe. I love recipe that are handed down like this. Wine is always a good idea in my opinion and will be trying your version soon! Super easy – I loved it! Happy to hear that Darla! Was wondering instead of the mushroom soup could I use something different want to make this looks delicious just not a fan of mushrooms? “Cream of” anything should work just fine in this recipe. Celery or chicken are great options! I’m so glad you loved it! :) Thank you!! I was thinking of using broccoli and cheese soup and ranch packet. Should I use all water or one cup of water and 1/2 cup of milk? I haven’t tried it with ranch mix but I would follow the same directions as listed in the recipe. I have only tried this recipe as written. Please let us know how this works out if you try it. Did you use glass or metal pan? In this case I used a glass pan. I’ve made this recipe several times for my ridiculously picky husband who does not like casseroles….and he loves it! I do have to bake it at 350 or it will never get done. I even goofed this time and only used 1 cup of water instead of 1 1/2 and I think it was even better, much thicker sauce. So glad he loved it!! This is so good! But instead of mushroom soup I used cream of chicken so delicious! This is sooo delicious (and having a fiancé on crutches for the next 3 months) it’s incredibly easy to prep! I don’t quite use 1 and a half cups of water; I cut it down just a bit to make the rice and cream mixture thicker. Love this recipe! I do not recommend using the homemade onion soup mix recipes advice of 5 T= 1 pack of onion soup mix, I only used 4 and it was WAY too salty! 2 T would’ve been much better. I have made this recipe for years. If you are short on time, you can prepare the dish on the stove in a large skillet. I brown the chicken, usually cut up, and then add the remaining ingredients along with two cups of water. Bring to a boil, turn down to low and simmer for 20 minutes. Your done! It has the same delicious flavor in less time. That is a great time saving tip Jennifer! Thanks! Recipe sounded good, but did not come out good. Wish I would have read the comments before making this. Followed directions exactly, and ended up with uncooked rice. Still in stove almost 2 hours later and rice is like mush now. Going to order a pizza and see if our dog will enjoy it. Waste of time and money. My rice cooks perfectly in 1 hour and 15 minutes… if you leave your rice in for 2 hours that can certainly cause it to come out mushy. This was delicious. I did make it with Minute Rice and it came out great. I sliced the chicken breasts length ways so they were thinner and would cook faster. I added as much rice as you plan to feed the size of your family. I did the largest amount on the rice. Prepared the dish exactly the same as in the recipe except for these changes, covered it, put it in the oven at 350 for 40 minutes and my family loved it. Thank you for sharing!! Glad your family loved it! It’s more like a stock cube. I have a recipe for homemade onion soup mix here that may help you. Can you cube the chicken and mix it all together instead of putting in whole breasts? I haven’t tried it that way but I can’t see any reason it wouldn’t work. Let us know how it turns out for you! I madethis lass week and everyone loved it. It was easy and quick and so very juicy. I’ve used basmatti rice and tonight am doing the long grain white rice. Everyone loved it!! Especially me, so easy to make! I’m so glad your family loved it!! I would like to make this recipe, but I noticed some had trouble getting the rice to fully cook. How do you get the rice to cook perfectly? Will anyone share their secret? I have not gotten a reply yet. I’ve never had a problem getting my rice to cook through. I use a long grain white rice and ensure my dish is fully sealed with tin foil. I hope that helps! I read a lady said she put her rice on the bottom of the baking dish, to ensure the rice cooked well. Is it best to place rice on top of the breasts still? or does it matter if its on the bottom. And as long as I seal it tightly with foil will the rice cook perfectly? I am a college student, and I don’t want to waist money and not have it come out perfectly. if it does not cook fully in 1hr 15 min. how much longer should we keep it in? Could you please answer all these concerns. I have only made this recipe exactly as written and it works out perfectly for me. I had another question about the 325 temperature. There is conventional and convection ovens. I have a regular gas stove & oven, do I still cook at 325 the recommended temp. or do I try 375 degrees? If you have a regular gas oven you should still cook this at 325 degrees. I have a 12 oz box of cream of mushroom soup. But it calls for 1 can (10)oz of soup, do I just measure out 10 oz of it using a measuring cup? A canned condensed mushroom soup has a thicker more jelly like texture so I’m not sure if your soup would have the same consistency. If it is a thick condensed soup base, measuring out 10 oz should be just fine! If I wanted to use brown rice, how much water would I add for 1 cup of rice? best estimate? How long should I keep it in the oven since brown rice takes longer. I can’t say for sure, I’ve only made this recipe as written. This was absolutely scrumptious! I was apprehensive because it seemed too easy but even my 5 year old (who eats NOTHING but plain rice) asked for seconds! I’m so glad your family loved it Michelle! Hi Holly! This recipe looks great. I’m wondering what garnish you’re using as a finishing touch in the video. Looks delicious. Thanks! Sometimes those old recipes are just be best ones! Do you cover the dish for baking? Yes, make sure it is covered. That is disappointing for sure. I have made this several times and it always works out, so I cannot say for sure why. Can I use a packet of uncle Bens wild rice and seasoning instead? I have only made this recipe as written, however if you do make this change please let me know how it turns out. Even my super picky 1.5 year old liked this! And it’s so quick and easy. Definitely making this again soon! So glad your family loved it Bobbi! I covered it with foil. I just got out on my own and am (at best) a remedial cook here so I have a few questions. 1. I don’t particularly care for mushrooms, are there any good substitutes for the cream of mushroom soup? 2. How large of a package of onion soup mix? 3. What’s a good way to tell when it’s done? Should I buy a food thermometer? 4. I was thinking of paring this with some grain muffins, but I only have one oven (two racks in the oven though) and the muffins cook at 350F, would it be possible to raise the temperature for the last 10 minutes, or could I do the muffins at 325F (they are a box mix I got for free when the school cafeteria was cleaning their stuff out)? 5. I enjoy spicy food, would chili powder be a good addition to make this spicy? 6. Cover with foil, right? Thanks in advance! Working to expand my cooking abilities. 1. Cream of “anything” should work just fine in this recipe. 2. I use a 2oz packet. 3. You can certainly purchase a food thermometer if you’d like however boneless chicken breast should be plenty cooked in the time given. You’ll want to ensure the chicken is white (and not pink) throughout. 4. Yes, this should work ok if you alter the temperature for the last few minutes. You could also remove it from the oven and leave it covered while you bake your muffins. 5. I think chili flakes would be a great addition or you could add a little bit of hot sauce once served. 6. Yes, cover tightly with foil. Do you think I can freeze this for a few days before using? Yes, it can be frozen! This was delicious!! I used the thinner chicken breasts and I cooked it at 375 for about 45 min. Turned out perfect!!! The chicken and rice casserole looks delicious, but what’s the ingredient you put on top of the rice, before adding the mushroom soup? It is cashews? Whatever it is, it’s not mentioned in the printed version. I made this recipe in the 1960’s/70’s and my family always loved it. It was originally developed by Campbell’s soups. However, there is a major difference between your recipe and Campbell’s: their recipe called for the rice to be mixed with the mushroom soup and water, and spread on the bottom of the pan. The chicken was placed on top and the onion soup mix sprinkled over it. I modified the recipe to mix both soups and water together, reserving some to pour over the chicken. Most of the soups/water mixture was mixed into the rice first, I think the rice needs to be on the bottom if you want to ensure that the rice gets fully done. This way, how tightly it is covered is less important. Also, I cannot imagine that adding 2 more pieces of chicken would add anything more to the cooking time in a standard oven. Go for it! I grew up with the onion soup mix sprinkled over the top of everything else. Try it sometime. Could i add some frozen broccoli florets to this? That would be a delicious addition! Hi Denise, I have only prepared this recipe as written, but your idea sounds delicious. Let me know how it turns out. I am so glad you liked the recipe Michelle! Could you use brown rice in this instead of white rice? Me and my brother share a household and we thoroughly enjoyed this recipe. It was so easy to prep and took almost no effort. Although it tasted like I spent all day on it. Only slight change was I used the broccoli cream of mushroom. Thank you very much for the recipe! I am so glad you and your brother enjoyed the recipe. Crea of broccoli soup sounds like a great substitution!! For chicken Rice Casserole can i use brown rice? I used what I had in my stock. I substituted chicken thighs for the chicken breast. I used Uncle Bens Long Grain Rice, Cream of Mushroom with Roasted Garlic, Lipton Onion Soup Mix. Recipe came out awesome. Not to mention very easy to make. Does the chicken have to be thawed or can it be frozen? I have only cooked this with thawed chicken. I am not a fan of chicken breast because they seem to dry out in a lot of the recipes that I have tried. Could this be made with boneless thighs? A reader commented earlier that she used thighs and it was great! Recipe says cover- Cover with foil? This sounds delicious! Wondering if I can do chicken thighs? You didn’t specify, boneless or bone-in chicken? Which is better? I prefer boneless pieces, but either should work. Hi! Do you use aluminum foil to cover this recipe? Making it tonight! Thanks! Yes, aluminum foil is perfect! Are you suppose to cook your chicken first? This recipe uses uncooked chicken breasts Nancy. Enjoy! Is there anything you could replace the onion soup mix for? My family really doesn’t care for onions! Thank you! I have a friend who is in the same situation as you! She still uses the onion soup mix, however she omits the onion flakes by pouring the onion soup mix packet through a sieve first. This still adds the flavour without the actual onions. Let me know if this works for your family. I didn’t have gravy or onion soup mix on hand so i sprinkled the chicken with some cheesy potato soup base. I am cooking this recipe now and it is still very runny and my rice is not cooking… I have had it in an additional 25 mins I’m concerned my chicken will be over cooked now. How much water do you use??? Combine mushroom soup and 1½ cups of water. What about using long grain and wild rice?! I think it would work, however I have not tried it. You may need to adjust the cooking time slightly. In have had this recipe in the oven at 325 for 2 hours now. The rice is not cooking and it is still really watery. Hopefully it tastes good when it finally gets done cooking. I don’t think I will try this again. Thank you anyways. Oh no, that is disappointing. I have made this several times and it always works out, so I cannot say for sure why. Did you cover it tightly? Hope it you enjoyed it once it was finished cooking. Trying tonight. Could not find onion soup mix but found a French onion soup mix. So hoping it turns out okay with the substitution. It sounds great to us! I made the chicken and rice casserole for dinner. I add cheese on the top and my family rated it 1 being bad and 10 being the highest they gave it and 11. That’s awesome! So glad your family loved it. Cheese would be great on this! What kind of cheese did you use? That sounds great! I am not a cook at all but this looked so easy, I thought I would try it. It literally took 5 minutes to throw together and it is absolutely delicious! Thanks so much! I’m so glad you enjoyed it Kathy! I’ve made this several times and it works perfectly at 325 degrees. If your rice isn’t cooked through, I would suggest increasing the cooking time by 20-30 minutes (or as needed). Just made this did the whole recipe to a T in a gas oven… set at 325 for 1 hour 15 minutes, covered with foil… everything is done BUT the chicken breasts, they are still raw. I have to use 6 pieces of chicken instead of 4 should I use more ingredients?!! Can you use 4 pieces of chicken and save the other 2 for something else? Do you need to change the amount of water or cooking time when using brown rice? I have not tried this recipe with brown rice. The cooking time will likely be longer. Please let us know how it turns out if you try it. 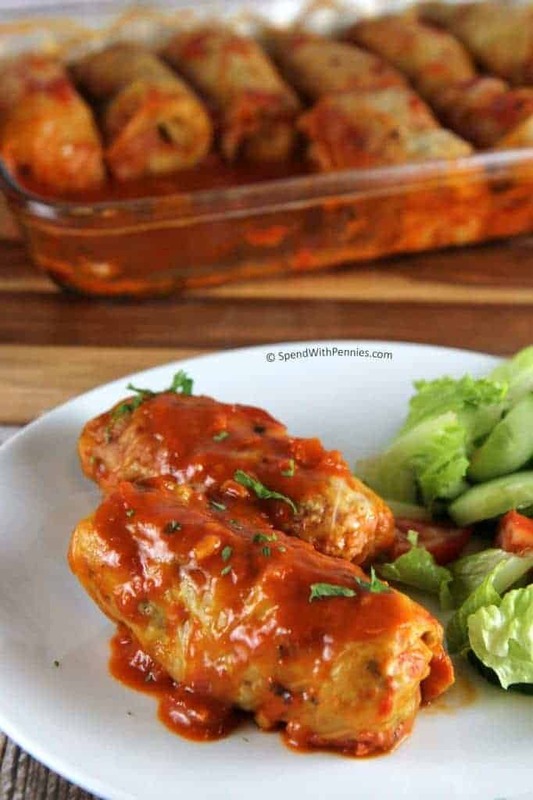 Hi, can chicken thighs be used in this recipe? Can you use a different soup other than mushroom as household not keen on mushies? Cream of chicken or cream of celery would be yummy additions! Can this chicken recipe be prepared and refrigerated overnight, then cooked the next day? I didn’t have onion soup so I used some Frenchs fried onions and it was awesome. I did have issues with the rice cooking through. What brand of rice are you using? On no, that is disappointing. Any long grain rice should work though. HELP!! Do you really only use one cup of rice? In the picture it looks like a ton more than one cup. I want to be sure as I am making this now!!! Yes, i was a bit hesitant about one cup of rice too. I have a box of Uncle Ben’s…so just pour one cup of that and not the entire box? Just one cup. One cup of cooked rice equates to about 3 cups of cooked rice. This reminds me of something I ate as a kid. I love the addition of onion soup. Making it today! Can’t wait! Yum! Thanks! Let us know how it turns out! :) Thank you! Can I make this in a slow cooker? If so, what changes would I need to make and how much time when it need to cook for? I have not tried it in a slow cooker. Let us know how it turns out if you decide to try it. HELP! I’m in the middle of making this recipe and am wondering, when you say 1 package of onion soup mix, do you mean both envelopes or just one? Just one packet. I hope you enjoyed the recipe! we are making this today for dinner.one thing of concern is using the long grain rice.husband said when he uses it in recipes it never cooks thoroughly..suggestions or anyone with that problem? that’s why we wondered about using minute rice but that probably cooks too fast..so will see.really enjoy input from ladies who have made any recipes we want to try..thanks..
Can I substitute chicken stock for water? Hi Holly, I have made this recipe that way, but I found the chicken stock cooked down faster than water. If you wanted to do a half and half mixture for extra flavor, it will yield delicious results, but be sure to keep an eye on it during the last 15 minutes or so of cook time. Would this freeze well before cooking? Could you use chicken stock in place of the water? Also I know that you used long grain white rice, but could you use minute rice? Last Sunday I made this for my family. I used chicken stock. I found it cooked a little faster and got dry. If you want to use chicken stock for extra flavor, I would recommend half water and half chicken stock, to keep it from cooking down too fast! I hope you enjoy the recipe! I mad this tonight and it didnt turn out right. There was still a lot of water when i pulled it out. Any suggestions on why it didnt turn out? That is disappointing. Was it covered tightly? That looks amazing and super easy. Do you think minute rice would work? That’s what I have on hand right now? (Not sure what the diff is exactly lol). Minute rice won’t work. Long grain rice or any rice that cooks for 20-25 minutes on the stove top is what is being called for in this recipe. Minute rice works perfectly fine with this recipe. Serving size would be breast with rice. What would the calorie count be for a serving? I think you could use Jasmine rice for delicious results! Can I make this in the crockpot? If so how much time should I give it? I make a lot for senior church groups and hope chicken tenders will do well in this dish. I will triple the ingredients for 16 people. What kind of gravy mix would you use? Looks great. What are the nutrional values on this? Think this can be adapted for a crockpot? Like maybe reduce the 1/2 or more of the water and cook on low? I work two jobs and I either have to cook in the crock pot or it has to be made within 20mins, so even tho this is a great recipe I just don’t have an hour to cook it. Any suggestions? Do you want the chicken breast thawed, or can they be frozen? Did you end up using raw chicken? If so, how’d it turn out? My husband can’t eat mushrooms, so I’ll be making this with cream of chicken soup! Or maybe cream of celery!! I’ve used cream of chicken many times with this recipe! Can you use pork chops instead of chicken and if so, would you cook the same amount of time? You could try pork chops but their texture is completely different, so it would require a different amount of cooking time. 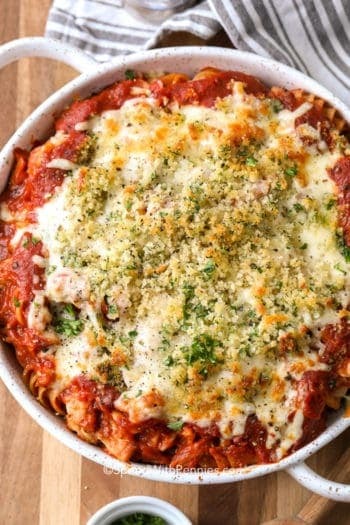 Hello could you cook this in a slow cooker.. if so how long..would it be low for 8 hrs or would that be too long sorry work full time and wiuld not have time to cook after work… tia. This is probably a silly question… but do you cook the chicken before you bake it or do you put it in raw? TIA. The chicken goes in raw. I used Brown rice and added peppers it was amazing! So glad you loved it, peppers would be amazing in this! I made with long grain wild rice and it was awesome! My husband loved it! Actually it’s in the oven now!!! Did you have to alter the cooing time with using brown rice? how much water did you have to add and how many minutes to cook the rice? Is the cooking time the same with brown rice? I assume it’s regular rice, not the minute rice. This recipe is the same as mine except I us equal amount of cream of mushroom and cream of celery. Mix with minute rice. Mixture should be thick, spread in oiled pan, cover in water and cut slits in it. Put your chicken on top and crushed up Lipton onion soup mix sprinkled over it all. One pkg should do. Cover, bake 350 degrees for about 50 minutes , then dig in. Dana, do you mean cover with foil, not water? Unless a recipe specifies Minute or other type of rice, it almost always means generic white long-grain regular rice, not pre-cooked, par-boiled (Uncle Ben’s), or instant (Minute). Never use instant rice in a recipe unless it specifically calls for it. YAY!! And now everything’s done! Enjoy a relaxing evening! I used long grain white rice. I use the minute rice and I’ve been making it since I was a teen ( I ‘m 65) I don’t care for the long grain rice cause it takes longer to cook. When using the minute rice, do you use the same amount of water as called for in this recipe? I accidentally used minute rice instead of the long grain! I just wasn’t thinking. Out of habit I usually cook with minute rice. Oops! I’m wondering how you made it work with using minute rice and how long you cooked it for. I’m worried I ruined the dish. Could you use brown rice? Do I put the chicken in raw or cooked? I haven’t tried it but if you do, I’d suggest eliminating most or all of the water. The rice soaks up the water and cauliflower may produce a little bit of liquid as well. I’ve made this dish and LOVE it. Just wondering if I needed to double quantity of rice if I would also increase the cooking time as well as water/mushroom soup combo? I have only made this as written so I can’t say for sure how much time it would take if you doubled the rice. Not all my rice cooked all the way!! What did u do wrong?!? Did you add the water to the casserole? Was your casserole tightly covered? You used the amount of water in his recipe for the minute rice?